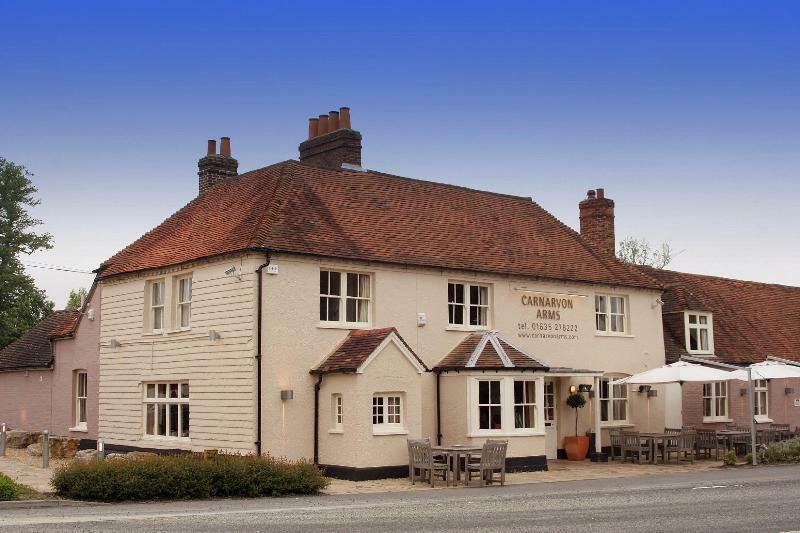 The Carnarvon Arms is a Grade II-listed building - The interior is decorated in fresh, neutral shades with rich leather upholstery and cartoons on the walls while the décor also pays homage to Highclere, with Egyptian-themed art in one of the dining areas. The full menu has a seasonal, modern British slant and many items can be ordered as starters or main courses: braised Gressingham duck leg with red wine and Puy lentils or a salad of scallops with Jerusalem artichoke purée and pancetta are typical. Conventional mains could range from grilled fillet of sea bream with sun-blush tomato, crushed potatoes and basil cream sauce to double-cooked shoulder of lamb with goats' cheese gratin, Savoy cabbage and rosemary jus. Finish with praline crème brûlée or crispy apple tart with apple sorbet. Pub 'classics' like liver and bacon with mash or beer-battered cod with chips and 'crushed' peas feature in the bar, and you can also get sandwiches every lunchtime (except Sundays). The wine list is well-chosen selection of bottles from around the world. The inn has 23 stunning rooms. My wife and I took my mother to Wheelers in Newbury for a Saturday lunch. Given the price tag the service was poor from the start. Having eventually got a drink from the bar staff (3) when the place was virtually empty, having been told that the reservation for 5 I made 7 days earlier was not in the diary, we were sat in the large and empty restaurant next to the only other customers (another group of 5). It was very quiet and most uncomfortable. The bistro style decor in the bar made way for lace table cloths which made me feel like I was visiting my Grandmother. But the the food is going to good right? It's owned by Marco Pierre White? No. My steak cost £32 for an 8oz medium rare fillet. Twice that of most gastro pubs so I was expecting something special. Unfortunately not so. Over-cooked was too much attention to the old world copper pans that came with it than the actual food itself. Things did not improve and getting the bill was almost embarrassing given just 2 tables of customers. The car park was flooded on departure (more to do with the recent builders and poor work), so an expensive and poor quality lunch. I've since been back for our Christmas lunch and things have not improved with our party of 18 chasing food and drinks. Example being cheese without the biscuits being served and the endless wait for coffee. If you like lace table cloths and poor service then this will be right up your street. This place with new staff, and a new chef, and a slight revamp to the decor could be so much more. Marco has clearly spend a mint on the place. We had not booked and dropped in early one Saturday evening for a meal. Very accommodating and nicely furnished and laid out restaurant. Decor was swish and attractive. Spotlessly clean too. Menu in summer 2012 a little disappointing but food was excellent. The fish was as good as it gets. Service was prompt and professional from young UK female staff, a nice touch. I sent back a £65 bottle of Mersault that was not up to scratch without question. Room for improvement but in the good restaurant starved Thames Valley one to give a go. Attractive location A4 apart. Happened across this lovely restaurant - the food was delicious and hit the spot. The service was excellent, so helpful. I would love one of the lovely wade fish water jugs.